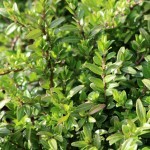 A low spreading, horizontal branching evergreen shrub with small glossy green leaves. Small, fragrant, creamy-white funnel-shaped flowers in spring are followed by violet-blue berries. 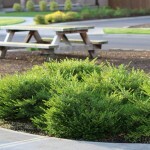 It takes full sun or partial shade and is drought tolerant once established. 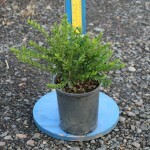 It responds well to pruning if needed. 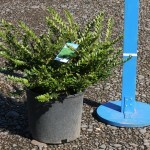 Useful for mass planting or ground cover.